Right now at Walmart you can purchase this National Geographic 3ft Tall Corrugated Cardboard Castle for only $5.00 (Originally $13.97), plus if you choose store pick-up you won't incur any shipping charges. 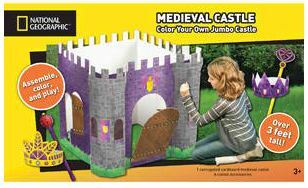 This castle will provide lots of entertainment since little ones can color their castle to look however they want. Watch as your children venture back into Medieval times and work on further developing their imaginations.